Things are going bad for poor Jet — his teacher has noticed that he hasn’t finished his assignment of writing out the Alphabet. So he explains to Mrs. May that he did, in fact, do it, but . . . well, did you read the title? A ran away. From there, Jet goes on to explain why each letter isn’t on his paper. D was scared, I just didn’t want to, something nefarious might have gone on with L, and so on. Each letter gets its own page with a fantastic picture personification and a line or two describing (in rhyme) why that letter didn’t make it onto the work. Wen’s art is never not delightful, but I really enjoyed this one and have flipped through it a couple of times just to look at the drawings — I love the T and O characters in particular. I’m not sure I can describe it, it might take away from the value if I could — but T’s teeth are about the best bit of art I’ve seen this month. 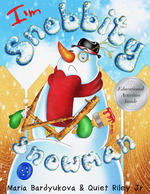 The details he fills the pages with are wonderful, eye-catching and will entertain adults as much as kids. I’m a little surprised that I’ve become, at this stage in my life (my kids are teenagers or older) to become a fan of picture book creators — but these two have turned me into one. This book demonstrates why. 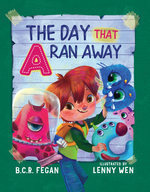 Typical of Fegan and Wen, The Day A Ran Away this is imaginative, fun, and well-written. I cannot imagine a child of picture book age (and maybe a little older) not being entranced by the art, there’s plenty going on for parents/others to point out, and a story that’s fun enough to read that someone wouldn’t mind repeating a few dozen times — which is more important than non-parents can realize. Disclaimer: I received a copy of this book from the publisher in exchange for my honest opinions about this book. I was excited — yes, really — to get the email from TaleBlade asking if I’d like a copy of this book. 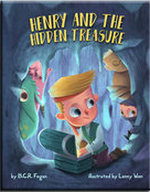 Fegan/Wen’s previous book, Henry and the Hidden Treasure, was one of my favorite books of last year. Could they live up to that one? Thankfully, they could at least come close. 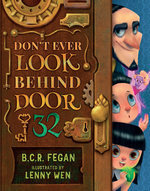 In these pages, Mr. Nicholas Noo takes two children on a tour of “the magical Hotel of Hoo” showing them all the wonderful things in store and repeatedly warning them, “Don’t Ever Look Behind Door 32.” He shows what’s behind every other door in between the warnings, most of which is wonderful, some of which is just . . . odd (which I prefer, really). Unlike Disney’s Beast, however, Hoo does more than tell the children not to go somewhere, he ultimately tells them why they shouldn’t go there. I can’t tell you what a pleasant change that is — even if this book is intended for kids — to get a book where a character just tells the others characters everything they need to know to react in a responsible manner. But this isn’t the place for that rant (as tempting as it is). This book isn’t as good as last year’s Henry and the Hidden Treasure but it’s close — the last page or so of Henry was a sweet note, this ended with a reveal/punchline. Is it bad? No — not at all, it’s just not as good in my eyes. That said, a punchline ending isn’t going to satisfy even a 3-4 year old on the 32nd read through (at least not on its own), but Fegan and Wen don’t rely on that — the book is full of jokes, clever lines, visual wonder, and lots of things to pay attention to along the way. Sure, you want the book to be appealing to kids, but the real key to success for a kid’s book is appealing to parents/grandparents/caregivers. They’re the ones who have to read, reread, rereread, and rereread again these things. Dr. Seuss and Sandra Boyton enjoy long-lived success because adults enjoy reading them. I think I judge books like this on this standard, but I rarely do it self-consciously. This is one of those books that adults can have fun with even on the fourth “just one more time” of the night. Which has nothing to do with the big reveal at the end, but the trip you take along the way. I’d say something neat about the typeface — it’s part of the look of the book, it’s fair game. But I say anything beyond “even the typeface is great looking” I’ll show I have no idea what I’m talking about, so that’s all I’m going to say there. I can honestly say that I never envisioned having this much to say about a 32 page book, but once I got started, I couldn’t really stop. I really dug this book, you will, too — especially if you have kids to read it to. I’m not sure why people started sending me Children’s/Picture books. I’m fine with it, don’t get me wrong, I honestly enjoy them — I just don’t understand why people started sending them to me. But I’ll gladly read any sent my way. There was enough diversity in the one’s I received this year that I wanted to highlight those I enjoyed the most. If people are putting out material like this, I think it gives hopes that little kids will be turned on to books the way I was as a toddler. Fun art work. Some fantastic use of language (especially when read aloud). A nice little story with a good moral. Ticks off every box. Was honestly tempted to put this on my 2018 Best Fiction list — I really loved this one, and wish I knew a kid to buy it for. Great imagination that will likely inspire someone else’s. Anthropomorphic flatulence — what little kid isn’t going to pay attention to this? Adorable art, cute story. A couple of weeks ago, I posted about a wonderful children’s book, Henry and the Hidden Treasure, and now the author of that book, B.C.R. Fegan is back on the blog for a few questions about the book and his writing in general. I’m fascinated by the process of putting together a book like this — have you and Wen worked together before? Do you script it out, including the images, like a comic book writer? Henry and the Hidden Treasure was the first book that Wen and I worked on together. She is an extremely talented illustrator which is what caught my eye in the beginning. The actual process of working with an illustrator is fairly straightforward. Generally, the first step is to have a designer who can lay out the book with the required margins and provide the text at a size appropriate for the age group. This layout (or scamp) makes it easy for the illustrator to see how much room they have to play with, and where any negative space should be. The next step is the brief itself. For Henry and the Hidden Treasure, a fair amount of direction was provided. This is only because when I write, I do it with the illustrations in mind. For children in this age group, the visual aspect of the story comes first and the narrative provides reinforcement to their imagination. This is why I needed scenes drawn in specific ways or from certain perspectives. The way this is done is simply by scripting out each page with characters, events, actions taking place and anything else that reinforces what is going on in that scene. Other aspects include any colors (if they are important), lighting, perspectives, emotions or a certain ambience that I’m looking for. In addition to this, I provide overall direction that is important or that might be helpful to the illustrator. What is great though with talented artists, is they can take this direction and elevate it to a place even more impressive than the scenes visualized in the mind. The third step is really the fine tuning. As the illustrations are completed and sent through, they are checked. Sometimes they are great the way they are – at other times, there might be some minor amendments. The final step is receiving the files in a project format ready for the design stage. As I mentioned it is fairly straightforward but by no means the only way of working with an illustrator. Wen and I work together really well and the process has always been quite smooth. I’m very lucky to know her. When I consider ideas for children’s books, I generally try to center my thoughts on exciting subjects or narratives. I want my books to be filled with imagination rather than lessons. So for Henry and the Hidden Treasure, the whole idea came about from considering hidden treasure – particularly as a child might perceive it. It was from this point that the story itself was crafted. Once complete, I didn’t really pick up the manuscript and think that it was ‘the one’. I guess my approach might be a little different to other authors, but by centering my thoughts on something that children already find exciting, I’m fairly confident that the idea will naturally develop into a nice story. I appreciated the subtlety of the moral/lesson to Henry and the Hidden Treasure — how’d you decide to convey it that way? As I mentioned previously, the subject of hidden treasure was where the story began. I think this leant itself quite well to considering what real hidden treasure might be in the context of the family unit – particularly with siblings. I wanted this to be a subtle theme rather than the driving force behind the book, mainly because I think imagination should take priority. Too many books start with the lesson, and often the narrative feels contrived. In the writing of Henry and the Hidden Treasure, what was the biggest surprise about the writing itself? Either, “I can’t believe X is so easy!” or “If I had known Y was going to be so hard, I’d have skipped this and watched more TV”. This is a difficult question. Henry and the Hidden Treasure actually came together fairly organically. I guess in a sense, writing it was quite easy. However, I remember something my father once said to me that I think applies to authors as well. I remember as a child watching my father, a locksmith, unlock customer’s front doors very quickly – sometimes in just a few seconds. On the rare occasion, a minor objection would be made about the cost in relation to the time it took to open the lock. He explained to me later that what so many people fail to realize is that his ability to open the lock so quickly was because he had dedicated his life to perfecting his craft. What sat behind those few seconds, was decades of training, study, understanding the right tools and constant practice. I enjoy writing, and have been reading and writing for as long as I can remember. Henry and the Hidden Treasure was definitely a pleasure to write and I certainly wouldn’t say any aspect of it was difficult. However I don’t want to leave the impression that this was just a lucky break. The difficulty for most authors I think lies in everything that came before! What’s next for you? Are you sticking with the children’s books? I actually have a long list of children’s books going through the stages of publishing. The next one should be out toward the end of the year. In addition to children’s books, I am in the process of writing Young Adult Fiction. I think the future will include children’s picture books, young adult fiction – and probably everything in between. Thanks for your time, Mr. Fegan. Readers (especially those with younger kids) — go check out Henry and the Hidden Treasure. It’d be easy for this to contain more words than the actual book — so I’ll try to keep it short. Henry’s got a little bit of money, and doesn’t want his little sister to get it. So he sets up a series of elaborate traps and challenges (think Raiders of the Lost Ark meets Home Alone) to keep her from it. Along the way, his imagination his on full display and he eventually learns something. There’s a very sweet ending that will hopefully teach by example. I cannot say enough good things about Wen’s artwork. It’s adorable. It’s dynamic. It’s simple, but eye-catching. It doesn’t detract from the story, but shapes and propels it. There’s not a lot of detail, but what’s there is important. For the younger set, I can’t imagine how this won’t become a favorite. Thankfully, it should be pretty easy for parents to re-read. Amusing story with great art. That’s pretty much what you’re looking for in this kind of book, right? Available in hard copy and e-book, it’s a great buy. Disclaimer: This book was provided to me by the publisher in exchange for my honest opinion.